The young girl has been officially identified and a reward is being offered for an arrest. Updated details here. A 3-year-old girl, shot as she was sitting on a porch, has died after a man opened fire along a Philadelphia street following an argument. Three others were also hit by gunfire. Gunshots rang out around 9:40 p.m. on Friday along the 1500 block of S. Etting Street near 27th Street in the Grays Ferry section of the city, police said. 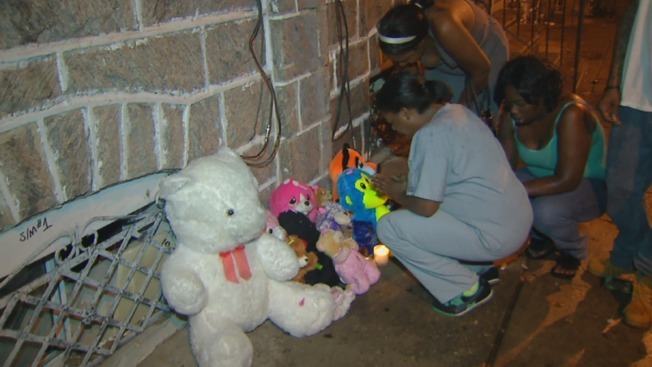 A 3-year-old girl is dead after she was shot by a stray bullet in the Grays Ferry section of the city. At least 3 others are injured. Philadelphia Police Capt. Michael Gormley said two men began arguing along the block when one pulled out a gun and started firing. A stray bullet hit the girl in the left side of her chest, Gormley said. Witnesses tell NBC10.com that the girl was getting her hair done when she was struck. Family and friends say the girl did not live at the home and that her mother was around the corner at the time of the shooting. Officers arriving on the scene put her in a patrol car and rushed her to the Children's Hospital of Philadelphia, officials said. But despite trauma doctor's efforts, she was pronounced dead at 10:21 p.m.
"There's nothing much you can say about this tragedy," said Mike Collins, the victim's cousin. "That was my little cousin. It hurts. Three other people were also hit by the gunfire, police said. The other man involved in the argument was shot in the head. He was rushed by officers to the Hospital of the University of Pennsylvania, police said. He remains there in critical condition. A 21-year-old man and a 28-year-old woman who police say were bystanders, were also struck. The man was struck in the leg. He was taken to HUP where he is currently in stable condition. The woman was struck in the arm. She was also taken to HUP where she was treated and released. Witnesses say the shooter fled the scene on his bicycle. Police took a person of interest into custody near the scene, but have not identified him as a suspect. As police continue to investigate, a memorial for the young girl, who family members say was named Tynirah, continues to grow. "That was my best friend's daughter," said Renee Bradford, a friend of the girl's mother. "She was everything to us. She ran around like a normal three-year-old girl. She didn't deserve this. She was simply trying to get her hair done. For her to get shot in the chest? She's a baby. No baby deserves to die like that."